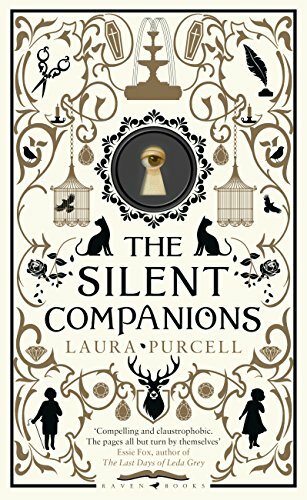 The Silent Companions by Laura Purcell is a dark gothic chiller with a page-turning plot set primarily in the 1860s, with flashbacks through the form of diary entries dating from the 1630s. It's a ghost story of sorts: Elsie Bainbridge, leaves her family's match factory in London for her wealthy husband Rupert's ancestral country home, at which he has suddenly (and inexplicably) died shortly after their marriage. When Elsie arrives at The Bridge along with Rupert's rather downtrodden cousin Sarah, she finds it full of locked doors, strange noises and neglectful servants, while the local villagers live in grinding poverty and refuse to come near the house at all, believing it cursed. This is so far very much the stuff of a standard Victorian gothic ghost story - a young woman isolated in a huge house and gradually coming to question her sanity as the goings-on around her become stranger and more terrifying day by day, while a mysterious 17th century diary reveals some shocking secrets. But there are some remarkably original touches here too, most notably in the form of the 'silent companions' themselves, life-sized painted figures (apparently popular curiosities in the 1600s) bought by one of the Bainbridge ancestors to amuse King Charles I and his queen. These become an integral part of the story and I don't think I've encountered anything quite like them before. There are also some extra layers to the story that come from Elsie's own family background, some explained in detail and some which are left ambiguous, which bring an additional dimension, and a slight folk horror edge to the diary sequences, which I enjoyed. Although this book is marketed as a ghost story, and it does have all the atmospheric creepiness you'd expect from that genre, I would say The Silent Companions is really more of a literary horror novel. Not all the scares are supernatural and not all the supernatural ones come from ghosts. That said, don't let this put you off if you're not a horror fan; like Susan Hill's The Woman In Black, this book will have a broader appeal that transcends genre. Elsie herself is an engaging protagonist, although it's hard to know how reliable her point of view really is. Sarah, her late husband's cousin, is also an interesting character with complex motives, and the awkward relationship between the two women is entirely plausible. As the plot gathers pace The Silent Companions gradually develops into a real page-turner and a great read for a dark winter night.